Benito Modesto "Ben" Pucci (January 26, 1925 – July 7, 2013) was a professional American football tackle who played three seasons for the Buffalo Bisons, Chicago Rockets and Cleveland Browns in the All-America Football Conference (AAFC) between 1946 and 1948. Pucci Grew up in St. Louis and went to high school there, but did not attend college. He joined the Bisons in 1946, where he stayed for a year before moving to the Rockets and then the Browns in 1948. While he was with the Browns, the team posted a perfect record and won a third straight AAFC championship. He was sent to the AAFC's Baltimore Colts in 1949, but left the team after he was asked to take a pay cut. Following his football career, Pucci worked in transportation and eventually settled in San Antonio in 1980. He died there in 2013. Pucci grew up in The Hill, a historically Italian American neighborhood in St. Louis, and attended Southwest High School, where he played on the varsity football team for four years and was named an all-district and all-city player. He did not go to college after graduating. Pucci played for the Hollywood Rangers of the short-lived American Football League in 1944, and had to turn down an offer to join the football program at Tulane University the following year because he had lost his amateur status by playing professionally. Pucci was given a chance to play for the Cleveland Rams of the National Football League in 1945, but decided not to take the offer. The Rams went on to win the 1945 NFL championship. Pucci joined the Buffalo Bisons of the All-America Football Conference (AAFC) in 1946, the league's first year of play, and played as a tackle in 11 games. The Bisons won just three games that year. Pucci moved in 1947 to the Chicago Rockets, another AAFC team, and played in 13 of the team's 14 games that season. The Rockets lost all but one of their games and ended with a 1–13 win-loss record. 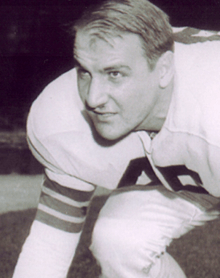 Pucci was traded in early 1948 to the Cleveland Browns in exchange for tackle Roman Piskor and the rights to draft Notre Dame's Pete Ashbaugh. He played 12 games for the Browns, who had an undefeated season and won their third straight AAFC championship. The Baltimore Colts, another AAFC team, bought Pucci from the Browns in 1949 along with two other tackles. Pucci played for the Colts for the first five games of the season, but quit after he and several other players were asked to take a pay cut. Pucci left football after quitting the Colts and started a career in the transportation industry. His career took him to California, Missouri, South Bend, Indiana and finally to San Antonio, Texas in 1980. He was a color commentator for the St. Louis Cardinals in the 1960s. He died in 2013 in San Antonio. He had two sons and a daughter with his wife Shirley. Pucci is a member of the walk of fame in The Hill in St. Louis. 1 2 3 4 5 6 7 8 9 Pils, Douglas (February 1, 2009). "Why a Brown roots for the Cardinals" (PDF). San Antonio Express-News. p. 2C. Archived from the original (PDF) on July 14, 2013. Retrieved July 14, 2013. 1 2 Crippen 2009, p. 270. 1 2 3 "Benny Pucci Past Stats, Statistics, History, and Awards". Database Football. Archived from the original on July 14, 2013. Retrieved July 14, 2013. ↑ Crippen 2009, pp. 270–271. ↑ "Center Goes To Rockets Sans Contract". Pittsburgh Post-Gazette. Chicago. Associated Press. February 7, 1948. p. 14. Retrieved July 15, 2013. ↑ "Browns Sell Three Pro Gridders to Baltimore". Youngstown Vindicator. Baltimore. Associated Press. January 28, 1949. p. 17. Retrieved July 15, 2013. 1 2 "Ben Pucci, Member Of Hill Walk Of Fame, Dies". The Hill St. Louis. Archived from the original on July 16, 2013. Retrieved July 15, 2013. ↑ "Ben Modesto Pucci Obituary". MeadowLawn Funeral Home and Crematory. Archived from the original on July 16, 2013. Retrieved July 15, 2013.